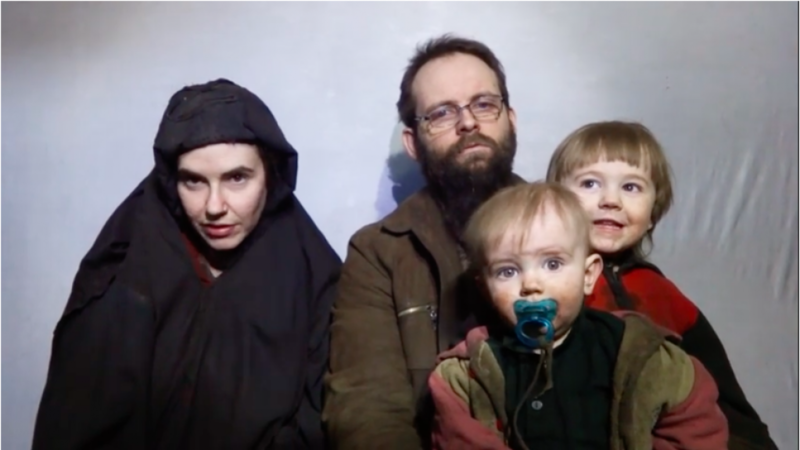 Caitlan Coleman and Joshua Boyle appeared with two of their children in a hostage video released by the Taliban in Dec. 2016. The couple, Caitlan Coleman and Joshua Boyle, had been held hostage by the Taliban since 2012. All three of their children were born in captivity. Coleman is an American citizen, while Boyle is a Canadian. The couple appeared in Taliban hostage videos after their abduction, including a clip released in Dec. 2016. At the time, they pleaded with their home governments to negotiate their release. While reading a prepared statement, Coleman said that her children had “seen their mother defiled.” She told President Obama that his “legacy” upon leaving office was probably most important to him and warned him not to become the “next Jimmy Carter,” who had to deal with the Iranian hostage crisis during his last year in office. “So, give the offenders something so they and you can save face and we leave the region permanently,” Coleman said. She also addressed then President-elect Tump, saying he must make concessions in order to win their freedom. Coleman specifically mentioned “Afghans who are prisoners in Kabul” that her captors “care about” and did not want to see harmed. Pakistan’s Inter Services Public Relations (ISPR) statement claims that the country’s officials cooperated with their American counterparts to secure the family’s release. Pakistan also claims that the family was held in Afghanistan and was only recently “shifted” across the border. “The success underscores the importance of timely intelligence sharing and Pakistan’s continued commitment towards fighting this menace through cooperation between two forces against a common enemy,” the Pakistani statement concludes. The move was undoubtedly intended to signal Pakistan’s willingness to provide more assistance to the US. The announcement was timed to coincide with an American delegation’s meeting today with General Qamar Javed Bajwa, Chief of Army Staff (COAS). In a speech delivered in August, President Trump took a hard line with the Pakistani government, citing its sponsorship of jihadist groups. “We can no longer be silent about Pakistan’s safe havens for terrorist organizations, the Taliban, and other groups that pose a threat to the region and beyond,” Trump said. Pakistan’s willingness to help free the couple and their children was a gesture, albeit a minor one, that parts of its military and intelligence establishment want to assuage the Trump administration. Shortly after Pakistan’s announcement today, the White House released a statement from President Trump praising the country’s cooperation. “Yesterday, the United States government, working in conjunction with the Government of Pakistan, secured the release of the Boyle-Coleman family from captivity in Pakistan,” Trump said. However, hostage-taking operations are just one part of the overall picture. Pakistan’s long-term alliance with jihadist groups poses many problems. The couple was held by the Haqqani Network, a key party within the Taliban coalition, which is seeking to topple the Afghan government. Pakistan has long sheltered and aided the Haqqani Network, as well as other senior Taliban leaders. The Taliban is the chief threat to the Afghan government. The White House’s statement today described the Haqqani Network as “a terrorist organization with ties to the Taliban,” but that doesn’t adequately reflect the extent of the relationship. It is not clear how the couple and their children were freed, or if the Pakistani government granted any concessions to the Haqqanis. In the past, jihadists have extracted significant ransoms in exchange for hostages. According to The New York Times, the Haqqanis mediated a hostage exchange between al Qaeda and the Afghan government in 2010. Al Qaeda received several million dollars in exchange for Abdul Khaliq Farahi, an Afghan diplomat who was kidnapped in Pakistan in 2008. Sgt. Bowe Bergdahl, an accused deserter, was captured by the Taliban in 2009 and exchanged in 2014 for five of the group’s senior commanders held in Guantanamo. The Taliban has threatened the Afghan government that “blood will be spilled” if other Haqqani figures are not released from custody. Still other hostages also remain in the Taliban’s custody. He’s dirty. He had a Salafist beard before he was even kidnapped and he has longstanding connections to jihadis. No wonder he doesn’t want a ride on our C-130. We might throw a bag over his head and divert to Gitmo. She looks like she converted too, and could grow her Afghan kiddies up into a couple of little strugglers. I wish they’d left them all there and not a paid a secret ransom via the ISI. The kids are innocent. They shouldn’t suffer because of their parents’ choices. Be glad that they now have a chance to live a normal life. At least have sympathy for the children. They didn’t choose to be born in Afghanistan. The oldest is just 4 years old. They shouldn’t suffer because of their parents’ choices. Be glad they now have a chance to live a normal life. Hate the parents all you want but leave the kids out of it. They’re innocent. Utter madness that a couple with children from a western country could trek in such a dangerous country like Afghanistan, where as a foreigner your more likely to be kidnapped by islamic terrorists. Moral of the story, research before you travel !! I think the Pakistani want to start the new game once more by releasing the couples. as I have passed many years in Pakistan this nation is not trusted at all, I am fully satisfied if the American trusted on game players nation they will face the music in near future. All the terrorist groups are trained in Pakistan in specific area, like in Peshawar, even in Karachi the small children are get upping after training they sending around the word. They even named the kids stupid names. What a bunch of losers. Who wears a headscarf in a hospital bed? A kooky convert. Tillerson looks like a fool thanking the Paks for playing US. Hubby’s a sneaky Salafist. Look at those dead fish-eyes.